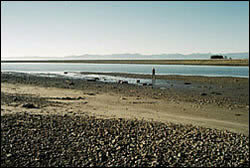 "From ridge tops to the sea"
Welcome to the ICM Motueka Research Programme web site. Its purpose is to provide information resources relevant to project participants and to the stakeholders of the Motueka River catchment. The site is a collaborative venture between a number of organisations. It was an 11 year programme which commenced in July 2000 and concluded in September 2011, and whose goal was to conduct multi-disciplinary, multi-stakeholder research to provide information and knowledge that will improve the management of land, freshwater, and near-coastal environments in catchments with multiple, interacting, and potentially conflicting land uses. The site will continue to contain items relevant to ICM but is now largely a legacy site. The Motueka River catchment is a Global HELP Catchment. According to the stream invertebrate communities recently studied at 46 sampling sites throughout the catchment, the majority of the Motueka River ecosystem is in good health.